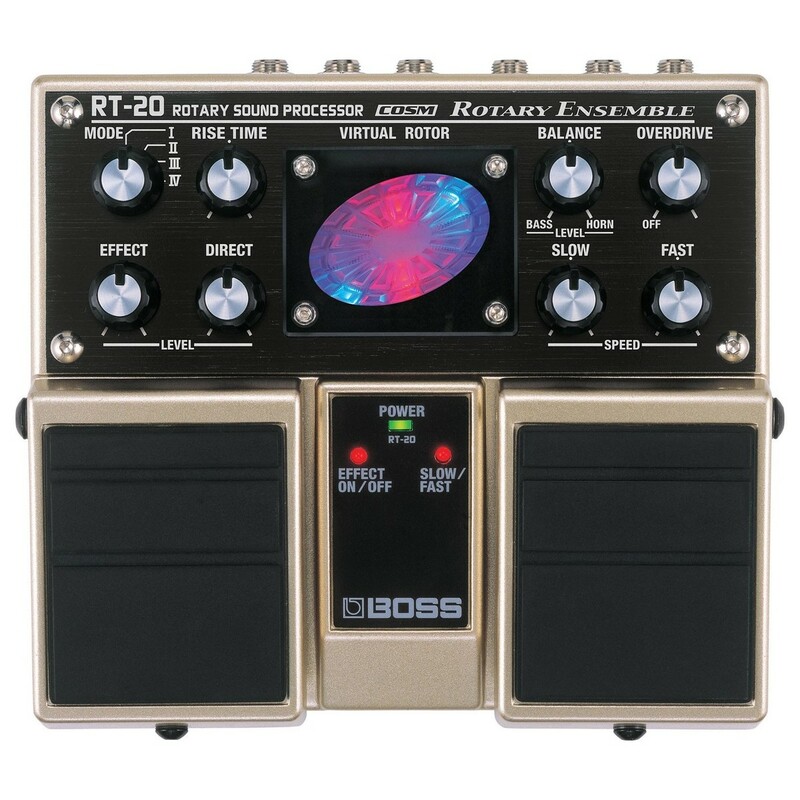 The Boss RT-20 Rotary Speaker Modelling Pedal features Boss’ COSM technology to authentically reproduce the classic rotary speaker sounds used by iconic musicians like the Beatles, Jeff Beck, Stevie Ray, and many others. Offering 4 types of classic and unique sounds, players can experiment with the extensive range of controls to create everything from a classic rotary speaker whirl, to rock-like overdriven textures and stunning pulsating effects. The addition of an EXP input allows players to connect an expression pedal, providing external real time control over the rotation speed and expanding its tonal capabilities. The RT-20 Rotary Speaker Pedal is perfect for both guitars and keyboards, with its stereo output ensuring players can captivate audiences in a world of animated soundscapes. The RT-20 Rotary Speaker Pedal is equipped with boss’ intuitive composite object modelling (COSM) technology, authentically reproducing the classic rotary speaker sounds used by some of the best musicians in the world. Using a wide variety of modelling methods to accurately emulate existing sounds as well as create its own unique soundscapes, the RT-20 delivers four types of rotary effects for an incredibly versatile performance. Its extensive range of controls provide adjustments to everything from rise time, balance, and level, to overdrive and the speed of the horn and bass speaker. Experiment with the controls to deliver everything from a standard rotary speaker to rock orientated tones, and create classic whirls, unique overdriven textures, and stunning pulsating effects. Not only does the Boss Pedal deliver stunning rotary effects, it’s also designed for a streamline performance. Players can connect a guitar or keyboard to the RT-20 and adjust the drive type switch to optimise the effect for either. Its dual outputs allow players to deliver a true stereo effect, giving their performance a beautifully animated sound that surrounds any audience. 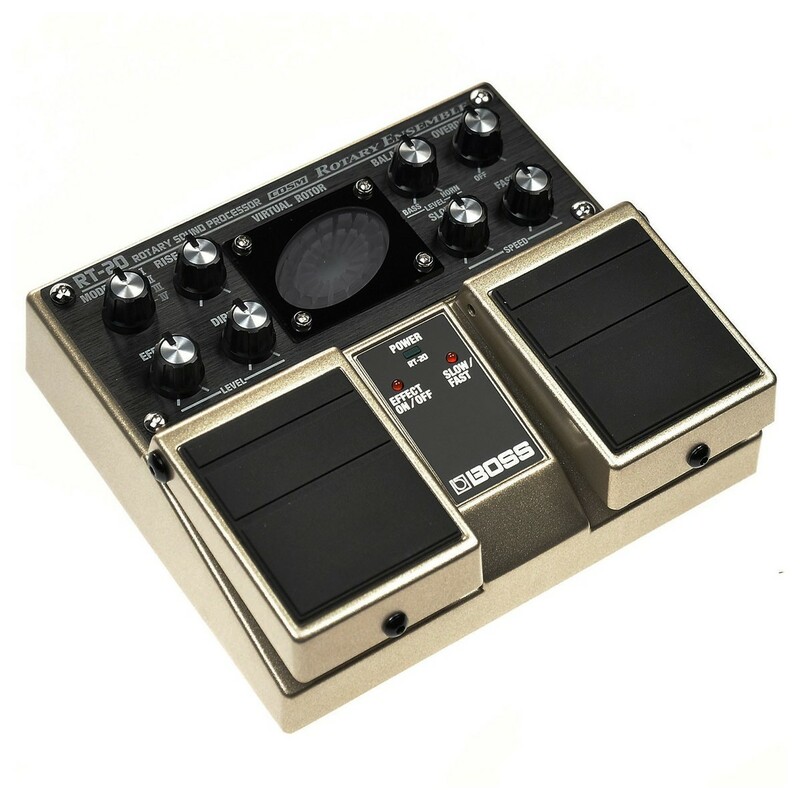 An expression pedal input is also added for external control over the rotation speed, while the headphone jack provides silent practice and experimentation. With its extensive tonal and performance capabilities, the RT-20 is the perfect way to express your sound in new ways. With that in mind, Boss have designed the Rotary Pedal to look as expressive as it sounds, featuring a stylish display to show a graphical view of the virtual rotors. Its centre red light provides a visual representation of the pedal's virtual horn, while the blue outside light displays the rotation of the virtual bass speaker, making its both attractive and informative to look at.